The demise of print magazines has been forecast in the media. Every time a newspaper publisher goes bankrupt, it is a chance to promote this position. But is print really dying or is just the media hype from the technology industry to sell us the latest and best widget? Or is this type of story a way to attract readers by focusing on a negative story angle? Perhaps a little of both. 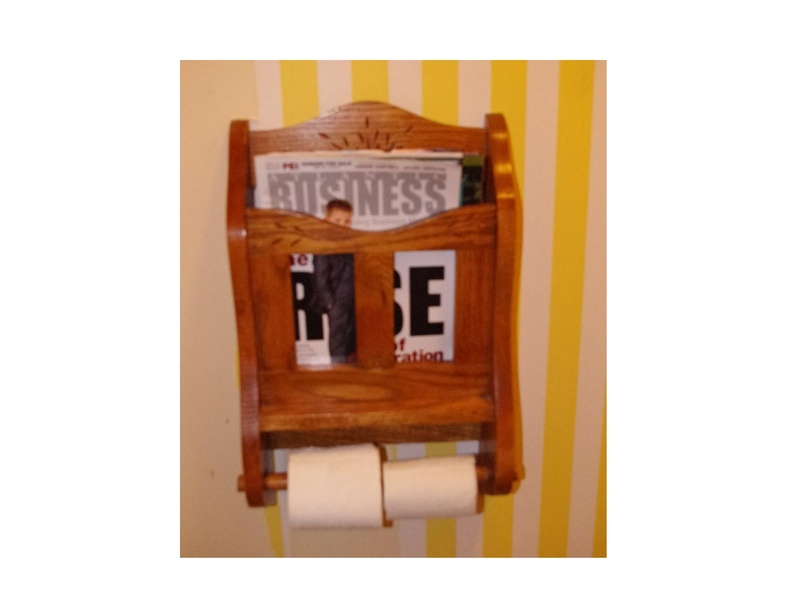 Will the magazine rack in the washroom be replaced by a Tablet? It’s a familiar story…..A new innovation gets introduced to great fanfare. Excitement builds, press coverage proliferates, and the warning sounds: get on board now or be left in the dust. According to zdnet.com – Print media is dead, but lives on in tablets and in eMarketer. Is print Dead? NO, just moving online – in 2010, people spent 9% less time reading newspapers and magazines as compared to 2009, which saw a 12% decrease. There is no denying the fact that coated paper and newsprint are showing shipment declines. Why is print shrinking? Technology has replaced paper distribution as a more efficient delivery method through less wastage. 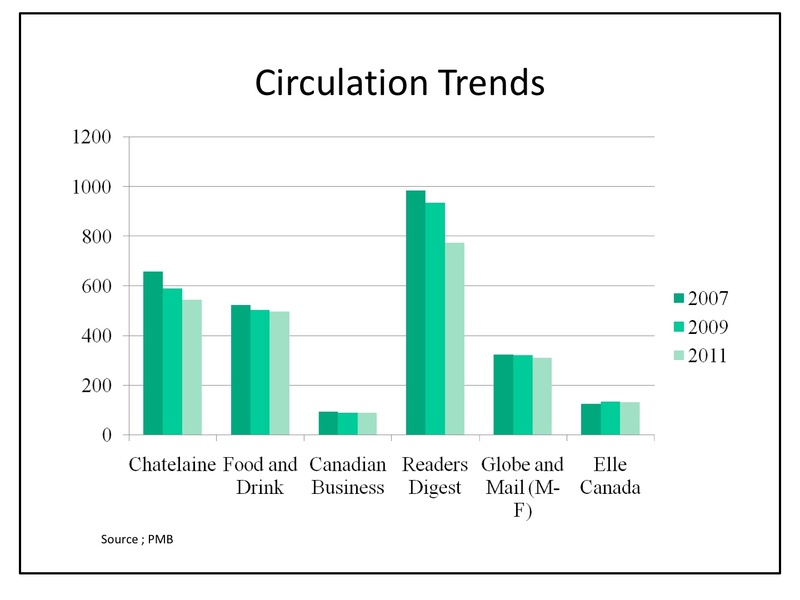 According to the chart below on circulation trends it is shrinking for some and growing for others. But it is still a $20 billion market in the USA, so it is still big business and it grew by $8 million in 2011. Perhaps it is stale management at the top clinging to old business models as the world changes before them. 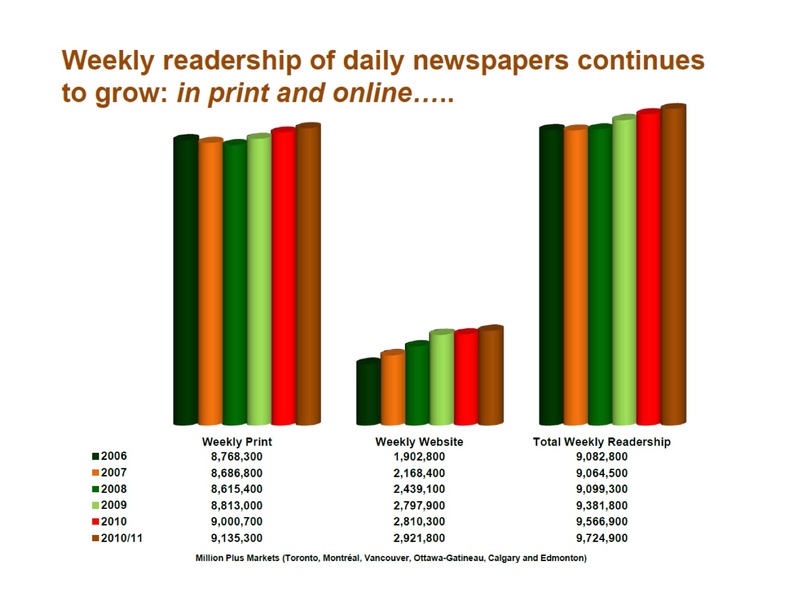 Newspapers are now news organizations, not just newspapers, and the readership continues to grow according to this report from Nadbank. People’s appetite for news is still strong, it just being consumed differently now. I still read the news brands that I trust, but now I read them online for free and don’t waste any paper. I also get the news faster as I do not have to wait the next day to get it. Other forms of print advertising include signage (billboards) and community newspapers, and I do not see them dying off at all as technology is not as efficient as print. Billboard advertising is location-specific so I doubt there is technology on the horizon that can replace this type of medium any time soon. And if there is, it will require major start-up costs to roll this out nationally to the thousands of locations and have ads that stand out. Current digital boards lack the creative capabilities of print. The flyers in my community newspaper continue to grow as retailers know, that to target homes in a local store marketing program the community newspaper is the best vehicle, not some website. A website cannot guarantee the household delivery that print can. Households look foward to the flyers as they can scan for deals from their local grocery store and comparison shop. big business for retailers to reach each store's local market. 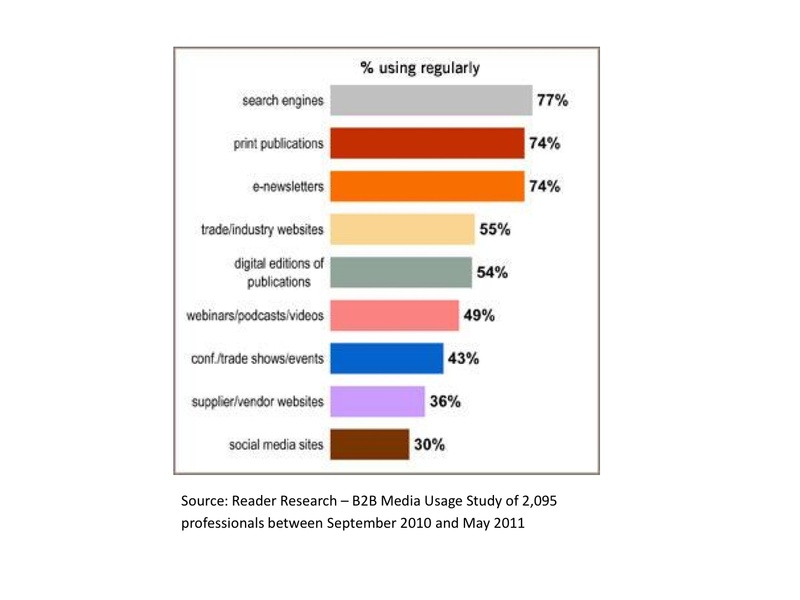 According to reader research on B2B media usage, print ranks #2 after search engines for advertising strategy. Wearing my media buyers hat, a print magazine offers a guaranteed audience through its qualified circulation that cannot be duplicated on a website; the closest vehicles are e-newsletters that happen to be #3 on the list. My best line I use if you want to target lawyers in Ontario is "can a search engine campaign deliver this?" In my opinion, no way, but can a magazine do this? Yes it can. You can choose from Lawyers Weekly, Ontario Reports and Lexpert as your magazine choices for example. Magazine publishers obviously have to add a digital distribution model to their magazine to attract the next generation of readers that are growing up with a tablet. The key to this is to create value in the eyes of the reader for digital content and not give it away for free whenever possible. Print has the benefit of being scarce and scarcity is the key to creating value. In a world where everything digital must be free, the value of the content goes down and thus the quality of the content, as publishers have no money to create content and that creates a downward spiral that we as an industry must get out of. Every time I read of a US newspaper going bankrupt I look at the owners. Most were real estate speculators who bought the company for its cash flow and downtown real estate, which they planned to flip and got caught in the economic downturn. So much of it was a case of those who don't know the business getting caught and those who don't run businesses giving their opinions on business management. According to a national survey conducted by Leger Marketing for Periodical Marketers of Canada, nine percent of Canadian magazine readers have bought an electronic edition of a magazine in the last year. Fourteen percent of respondents reported planning to buy a digital issue of a magazine in the next year. Seventy-one per cent of respondents said they prefer to read magazines in print form due to portability, the tactile experience and ease of browsing. While 45% of respondents said they have bought a magazine at a newsstand in the past month, 56% of those who bought electronic magazines also bought print copies. "The so-called doomsday scenario that has print magazines doomed to obscurity is just a myth," said Ray Argyle, executive director of Periodical Marketers of Canada. 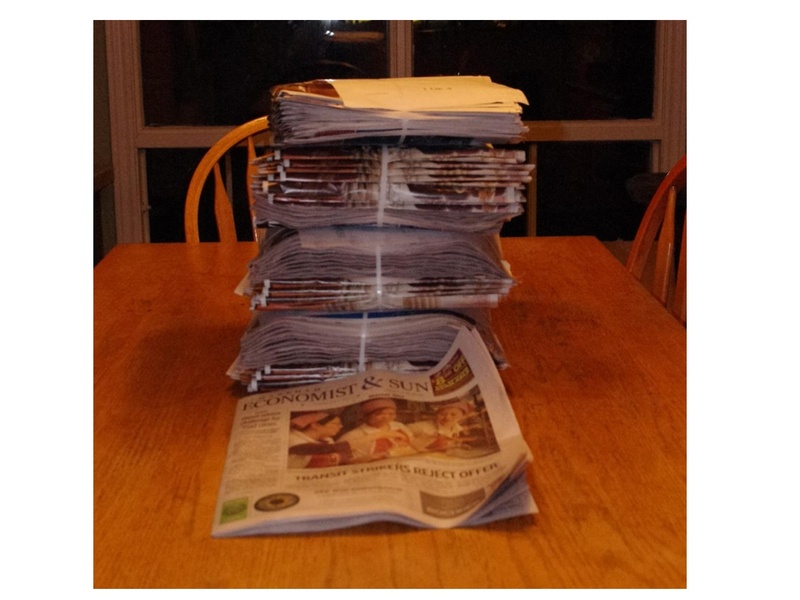 "The trend seems to point toward the purchase of single copies and away from mail subscriptions. Seventy per cent of over-65s have mail subscriptions compared to 45 per cent of those under that age, while many in the under-35 group are buying more, not fewer, magazines at the newsstand." Well, you won't be reading them for free much longer. The NYTimes will be reducing its online free access from 20 stories to 10 next month, and you can bet it will vanish to zero really soon. Globe & Mail will be rolling out its online content paywall sometime this year, and already does for GlobeInvestor. The model definitely WILL change, because it has to. Just to clarify, print is not dead as it is still more convenient to read a 200 page copy of Canadian Living in print than as an app or digital edition in my opinion. Research has shown that the women's service category is the strongest of all the print titles, but women are the heaviest users of ebooks. Seems s like an oxymoron but it is true. Oh yeah! Forget this copy of Macleans - my Canadian Tire and Future Shop flyers just arrived! It's awfully comforting to know that really annoying door to door flyers will thrive in the sad print-is-dead scenario.